Federal law requires DOL to adjust civil penalties for inflation by January 15th of each year and to issue a final rule in the Federal Register. This year’s publication was delayed due to the partial government shutdown. The new penalty levels took effect yesterday. See the full story here. The final version of MSHA’s Workplace Examination rule was published on April 9, 2018. It appears to retain the bulk of the changes imposed by the January 2017 rulemaking. The new rule takes effect June 2, 2018. A competent person must complete a workplace examination at least once each shift for each working place where miners are scheduled to work. Mine operators must promptly initiate any necessary corrective actions for identified adverse health and safety conditions. Mine operators must provide timely notification of adverse conditions that are found but are not promptly corrected to miners who will be working in that place. the mine operator must keep the examination record for one year and make the record available to MSHA and the miners’ representative, with a copy provided upon request. check records to be sure that proper follow-up occurs in documenting corrective actions. For questions or if you need help implementing the proper paperwork contact our office at (518) 623-2352. 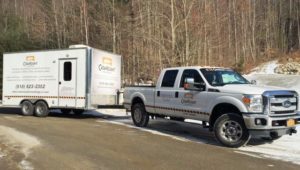 Catamount Consulting, a leading national safety consulting firm, today announced they have added a new Mobile Hearing Trailer to their existing services. Catamount Consulting delivers a complete audiometric testing solution for any size company in all Northeastern states. Our Hearing Conservation Programs are designed to make OSHA & MSHA compliance fast, easy and affordable. Sending your employees off-site for hearing testing consumes costly travel and labor expenses, that’s why Catamount comes to you. Our Hearing Conservation Programs include: Noise Level Monitoring, On-site Hearing Testing, Training & Education, Reporting and Data Management, Consultation and Review, Hearing Protection fitting, CAOHC-Certified professionals. The new Mobile Hearing Trailer can provide group testing of up to 6 employees every 20 minutes, monitor ambient noise levels within booths, equipment calibration verified on a daily basis, validation retesting, immediate results available in English and Spanish, digital administrative reports sent directly to company contact. Founded in 2005, Catamount Consulting is a national safety consulting firm with a team of dedicated consulting professionals whose practice is the implementation and execution of workplace safety and regulatory compliance programs. Services provided include OSHA training, MSHA training, general safety training, comprehensive safety services, rigging training, firearms training and safety instruction, safety audits and abatement, preparation for site inspections, citation litigation services and mobile hearing testing. It is common knowledge that training and development is essential for organizational success. People with greater skill, ability and knowledge will perform at a higher level than their peers. For mine and construction workers, this also means they work safer. It’s no surprise, then, that the busiest time of year for safety training professionals is right now. Intermittently operated mines and construction sites will soon be producing again, and many new employees enter the industry…while many more return from seasonal layoffs. Training prepares these workers to safely navigate the potentially hazardous conditions that are either entirely new or not fresh to them. Timely and relevant training will also help boost productivity. By closing skills, knowledge and performance gaps, as well as arming your employees with new ideas, best practices and skills that they can put into practice in their jobs right away, their competence, ability and confidence levels increase. As a result, these employees are able to make better decisions and do their jobs smarter, more efficiently and more safely. Fortunately, technology is making training better and easier to deliver than ever. More important, it facilates a more diverse approach. Every organization and every work site has unique needs, and the ability to customize training to meet these needs will yield better results. For most organizations, blended learning solutions often prove to be the best option. For example, balancing on-site training and classes with a cloud-based learning management system provides for greater efficiency, improved tracking, and easy delivery of common training requirements, while still allowing for worksite specific programs. The ability to seamlessly and cost-effectively combine different training delivery methods, which technology allows for, creates more comprehensive, effective training. It’s good for both employees and employers, and it’s good for the bottom line—safer, higher producing worksites. About the author: Scott McKenna is president of Catamount Consulting’s New York office and is a professional member of the Society for Mining, Metallurgy & Exploration (SME), a certified instructor with the Mine Safety Health Administration, and an OSHA Certified Construction Trainer. He can be reached at smckenna@catamountconsultingllc.com or (518) 623-2352. The Mine Safety and Health Administration has issued a safety alert on preventing accidents at mines from miners falling. In the past decade MSHA states, 29 miners have died at metal and nonmetal (MNM) mines when they fell from the area where they worked, such as heavy equipment, ladders and conveyor walkways. • Make mobile or stationary platforms, from which miners may work, available at locations where there is risk of falling. • Assign a safety harness and lanyard to each miner who may work at an elevated height or locations where a fall can occur. • Construct stable, durable and secure anchor points for miners to attach lanyards at all locations where a fall hazard exists, and inspect these anchor points frequently. Post signage, “FALL PROTECTION IS REQUIRED HERE”. • Place stable and secure physical barriers around all floor openings through which miners may fall. Yellow caution tape is not acceptable to use as a barrier. • Design work areas and develop job tasks that minimize fall hazards. • Mine operators and independent contractors must always comply with these four standards that help prevent falls from occurring: §§56/57.11001 Safe access and §§56/57.15005 Safety belts and lines.